History Undressed: Um...Why were you going to bleed me again? Um...Why were you going to bleed me again? You want to do what? And no pain meds? Oy! 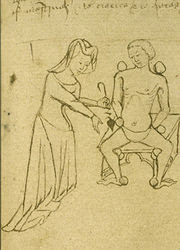 Today on History Undressed we are discussing Medieval medicine. During Medieval times the church played a large role in medicine, as it did with most things. Monks were trained in colleges to become physicians, and followed strict rules in order to heal a person. A lot of their healing practices derived from Greek and Roman texts. There were physicians who weren't monks however, and they did use some other ways of healing patients that monkes were against.Some laymen were also made into physicians by attending universities or joining a medical guild. Even these men in the medieval ages were sometimes ostracized because they were not of the church. However if they belonged to a guild they were often protected, if not… it was two groups against you. If they did go to school, they began at age 14 and went through school for about 12 years before they could begin practicing. In most cases surgery wasn’t even contemplated unless it was a life threatening situation. Some other forms of surgery were to remove cataracts from the eyes, and trepanation. 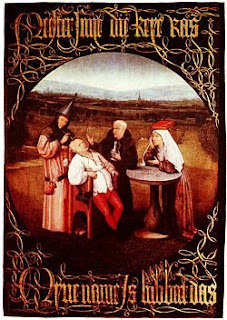 Trepanation was when a hole was made in the skull of a person to relieve pressure. It was often the cure for those who had seizures. The monks didn’t believe in pagan healing ways, such as the use of herbal medicines, and intricate surgeries. A lot of women healers who used their herbal remedies to heal people were considered witches. They believed that everything happens because of God, everything happens for a reason. A lot of times they believed you had done something wrong and angered our Holy Father, so in most illnesses you would be rubbed with holy water, anointed oil, maybe have relics of the saints presented to you and they’d pray for you. If you died, I guess you deserved it. But this was very early on. Soon the church came to believe that God provided things in nature to help us heal. St. Augustine played a big part in changing the tune as did Marcelli with his book De Medicamentis Liber, which came out in 1536 (some consider the medieval era to have ended in 1400 to 1501, I like to think it lasted just a little longer) and discussed how to use certain plants, gems and other natural substances to cure the sick. However, these new curing methods were still seen as slightly skeptical and were only accepted if done while using Christian incantations. Medieval medical practitioners believed in the four humors, blood (air), phlegm (water), yellow bile (fire) and black bile (earth). They believed that in order to be healthy all four needed to be in balance of one another. They balanced the humors by diet, medicines and blood-letting. 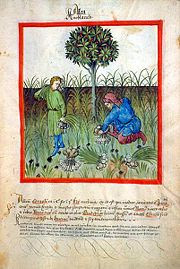 As far as diet, in the medieval ages, the majority of the population consisted of peasants. These people were too poor to afford a properly balanced diet, and ate mostly bread, meat or fish. In some cases they were able to get some fresh fruits and vegetables, and it was even harder to get cheese and butter. 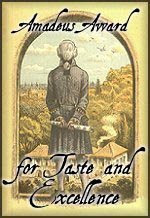 Needless to say, the wealthier folk had a much more balanced diet, and in most cases were on the healthier side. Keeping the humors in balance depended on the seasons as well, hot, cold, wet or dry. Most plants, herbs and household goods were categorized according to this hot, cold, wet or dry theory. Moods were characterized by the four humors, Choleric (yellow bile), Sanguine (blood), Melancholic (black bile) and Phlegmatic (phlegm). They also counted a lot on astrology, compass directions and the four evangelists, Matthew, Mark, Luke and John. One major fault in the humor theory, was that they didn’t believe that blood circulated through the body. When physicians came to call on a patient or the patient was brought to them, they often checked the blood, urine and feces of a patient to see if the humors were in balance of one another. Blood was checked for hot or cold. Was it greasy or foamy? How fast did it coagulate? They would take a persons pulse to see how strong their heart was. After thoroughly examining a patient and listening to the patients own version of events, the physician would commonly check their “leech” book, a popular one written in the 9th century was Bald's Leechbook. This would tell the physician if they needed to bleed the patient or not. 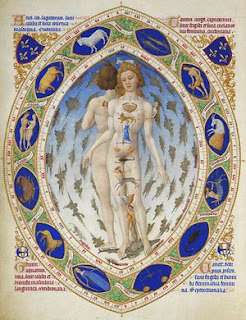 Another book physicians relied on was Tacuinum Sanitatis (Handbook of Health). Bleeding a patient would draw all of the noxious ails from their organs, and make the person well again. Choosing a specific vein depended on what humor was out of balance. The dangers of blood letting (and not using a leech) were vast. A physician could cut an artery instead of a vein and the patient could bleed to death. The incision could become infected, not to mention you are weakening the already sick person. Unfortunately, for most patients, if they were bled they either got sicker or died. I wonder why the docs didn’t realize this and stop bleeding their patients sooner? I know if I went to the doctor and he said to me, “I know you’ve been sick lately. Instead of prescribing antibiotics, this time we’re going to bleed you.” I’d run as fast and far away as I could! 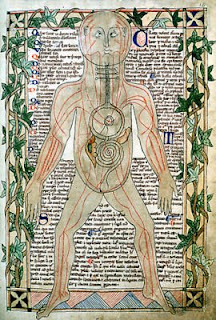 The Tacuinum Sanitatis, listed six things essential elements to keep a person healthy: a healthy balanced diet, fresh air, getting a healthy amount of exercise, getting plenty of rest, secretions and excretions of the humors, and your mental state. As long of all of these things were in balance you should be healthy. 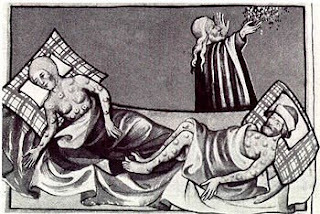 In the case of the Black Death in the 14th century, medical practitioners came to realize you could catch the illness by breathing the air of a sick individual, hence the quarantining of families, and sometimes whole cities. Lepers were another group who were ostracized. They were banned to leper colonies or hospitals. It is also important to point out that many women practiced medicine as well. Much more than was recorded. 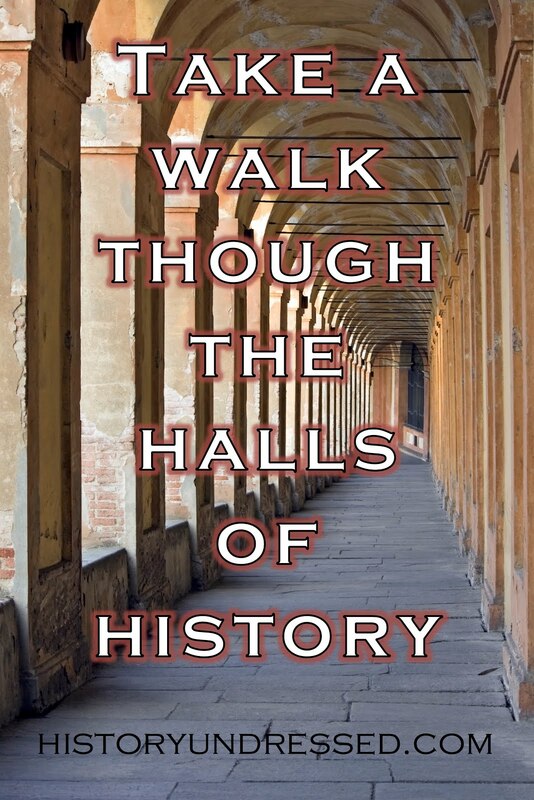 Women became physicians, nurses and midwives. However a female physician was often controversial and she would most probably have been ostracized quite a bit. In 1150, Abbess Hildegard of Bingen wrote a book titled, Causae et Curae (Causes and Cures), which discussed her medical advice and philosophies. Another physician who specialized in females was Trotula of Salerno and her work, De Passionibus mulierum (The Diseases of Women) written in the 12th century. Some obstetricians today even say how great the work is and her knowledge of the female body was vast. Midwives and nurses were very important for female health. Especially since monks, who consisted of most of the physicians at the time, were not allowed to touch females let along examine them. These women often used the more natural cures for ailments. In order to become a midwife, you either learned a practiced with an older and more experienced midwife, or you grew up with a male physician as your father or guardian who introduced you into the field. I could never understand the bleeding cure. I would venture to say that it had to have more negative side effects than not. And leeches...ick...they give me the willies! Great post Eliza. Reading it I was reminded of this old Saturday night sketch, where Steve Martin played Theodoric of York who was a medieval barber/doctor. I too could never understand how removing blood was a cure. Leeches, however, are still used today. Thank god for modern medicine, although I do think that one should consider a combination of homeopathic as well as western medicine. I've found that herbal cold medicines work better for me than regular medicine. Thanks for your comment Willow! The bleeding definitely had more negative side effects even death than any good!!! I HATE leeches, I just think they are really gross! Thanks Elizabeth. I think I saw that sketch! Back in the good old days when SNL had Steve Martin, sigh... I agree about the homeopathic plus modern medicine. I use a variety of herbal teas when I'm sick depending on what my symptoms are. I also take a lot of vitamins, and add certain herbs to my recipes. What an interesting poost. I have never been able to understand why people would let anyone cut them to drain blood. I wonder whoever thought up this barbaric idea in the first place. Glad we have such good medical practices in place now. Great post! I have a book coming out in 2010 for kids about the history of medicine. It’s such a fun subject because there were so many odd cures used throughout history. Regarding bloodletting, I never thought about what would happen if they missed the vein and I wonder if that happened frequently...especially later on when barber-surgeons did most of the bleeding? btw, I think the practice of bloodletting survived so many years because it does work to some degree. Staphylococcus aurerus (Staph) (the nasty bateria that causes things like pneumonia) feeds on a specific type of iron found in blood called Heme iron. Doctors today believe that bloodletting temporarily starved the Staph bacteria. The trick was they had to catch the infection right at the start of a sickness. They also had to take just enough blood to starve the Staph, but not so much that they weakened the patient to the point that they couldn’t fight off the infection. But I agree...I would run too! Thank god for antibiotics. Thanks Bearded Lady! I can't wait to get your book for myself :) That is very interesting to know about the Staph. I never thought of that. I'm sure the barber-surgeons missed a lot... Whoops! Wrong one, sorry my lord, shall I call the priest? 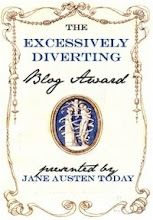 Sorry this is so late, Unfortunately Bleeding was done well into the 19th century. Worse was cupping, the heating of a glass until it was red hot and applying it to the skin until huge blisters appeared. When they filled with fluid it was drained. It was thought that ill humours were removed. Thomas J Jackson had this done to him after Chancellorsville in 1863. In the film Restoration, 1995, Robert Merivel becomes the Kings physician after curing the Kings pet dog. The dog had been cupped. "Doctors today believe that bloodletting temporarily starved the Staph bacteria. The trick was they had to catch the infection right at the start of a sickness. They also had to take just enough blood to starve the Staph,"
This shows an astounding ignorance of the etiology and proression of septicemia. If there is staph in the blood, reducing the blood volume will not affect the staph's ability to attack the remaining red blood cells and, to boot, there will be fewer whited cells to attack the staph. Puh-leeze, don't propagate such nonsense.